The preservation and reuse of the historic Boston & Maine Railroad’s Moose Brook Bridge as our new Trout Brook Bridge has been recognized by the HeritageRail Alliance’s Significant Achievement — Structures Award. Stewart Rhine photo. Our Museum has received national recognition from the HeritageRail Alliance in the form of its Significant Achievement — Structures Award during the HRA’s Fall Conference held in Santa Fe, N.M. November 7th through 10th. HeritageRail is a national alliance of tourist, scenic, historic and excursion railroads, as well as railway and trolley museums. HeritageRail Alliance is moving railroad preservation into the 21st Century by developing and supporting the best practices and brightest minds in conservation, operation, exhibition and interpretation. 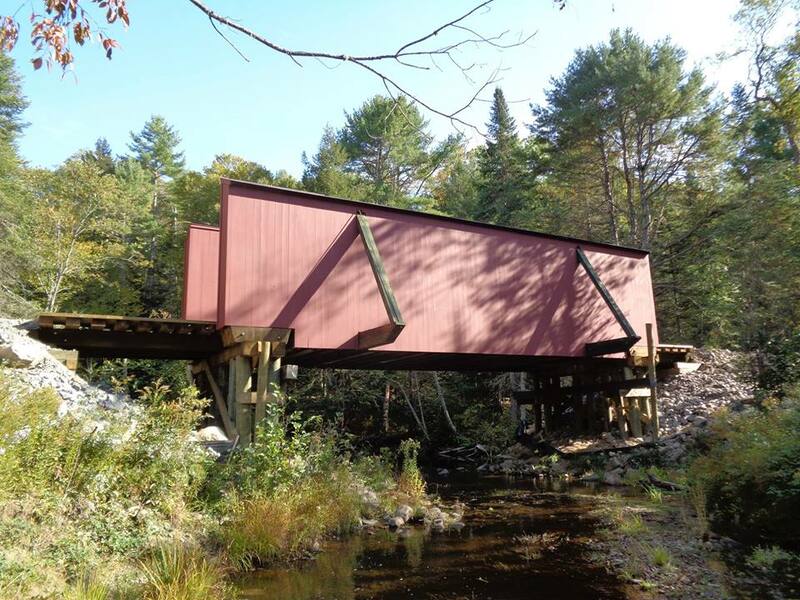 The Significant Achievement Award — Structures Award recognized the rescue, reconstruction, moving and placement of a former Boston & Maine Railroad boxed pony truss covered bridge on the main line of the WW&F. The bridge arrived at our Museum’s Sheepscot station parking lot in pieces on October 4, 2017, and in the span of only 11 months was reconstructed and then moved by highway about four miles and placed over Trout Brook. You can read more about our Trout Brook Bridge project in our September 12th post. 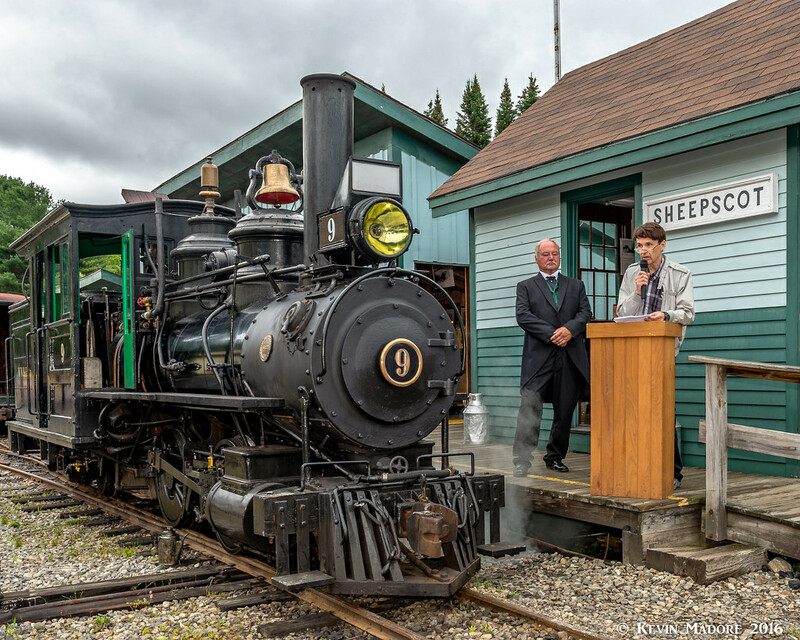 Thanks to the preservation efforts of three generations of the Ramsdell/King family, our Museum was able to restore historic locomotive No. 9 to service December 5th, 2015. The family was recognized by the HeritageRail Alliance through its Friend of Railway Preservation Award. Dale King (right) spoke at No. 9’s dedication during our Annual Picnic August 13, 2016, sharing his family’s lengthy devotion to No. 9. Past Museum President Steve Zuppa looks on. Kevin Madore photo. While at the Fall Conference, our Railway Superintendent and Chief Mechanical Officer Jason M. Lamontagne also accepted, on behalf of the family, the HRA’s Friend of Railway Preservation Award recognizing the three generations of stewardship by the Ramsdell and King families of West Thompson, Conn. of WW&F locomotive No. 9, a two-foot gauge 0-4-4T built in 1891. Frank Ramsdell and his friend William Monypenny rescued No. 9 from the scrappers in 1937. Following Ramsdell’s death in 1954, His daughter Alice continued to protect No. 9. Alice died in 1994, and her nephew Dale King became the caretaker of the long-held family dream to return No. 9 to steam. In 1995, he came to an agreement with our Museum for a long-term lease that saw the locomotive moved back to Maine, where a 10-year overhaul began. This included a new boiler and the rebuilding of the running gear and cab. On December 5th, 2015, No. 9 steamed over the two miles of the WW&F Railway, marking its first travel over the line since 1933. King was present for No. 9’s formal dedication on August 13, 2016, when he spoke of his family’s lengthy devotion to No. 9. Congratulations to the Ramsdell/King family for this well-deserved recognition, and to Dale King for permitting us to restore #9 and return her to service! More information on these two awards can be found on the Trains magazine News Wire in an article written by Wayne Laepple. Previous PostOnline Reservations Now Full for Victorian Christmas December 15th.Next PostOur “21 Campaign” Surpasses Our Goal!